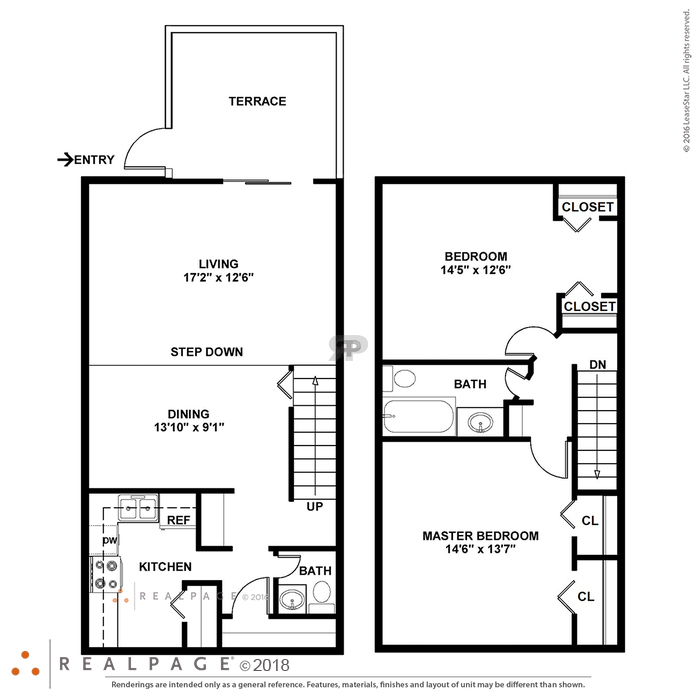 This floor plan is located at the ends of the building . 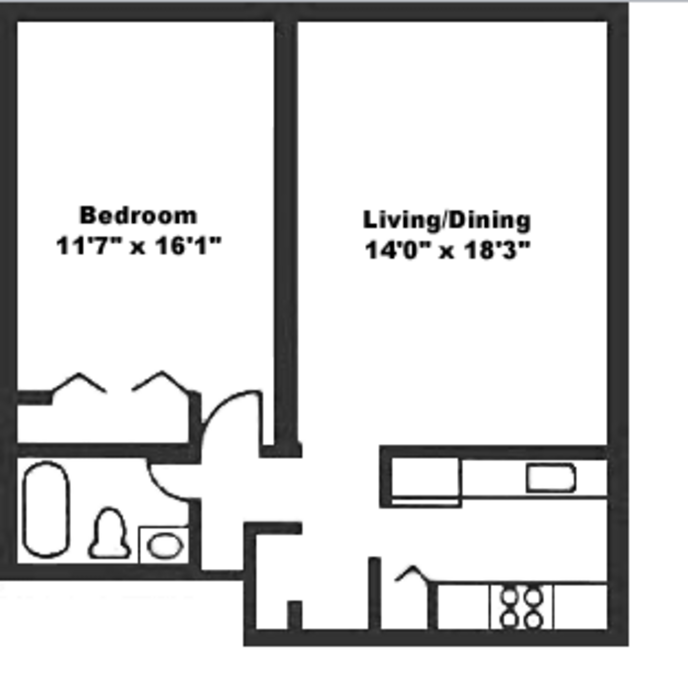 Bedroom size 11'7" x 16'1"; Livingroom size 14'0 x 18'3"; With Kitchen and one Full Bathroom. 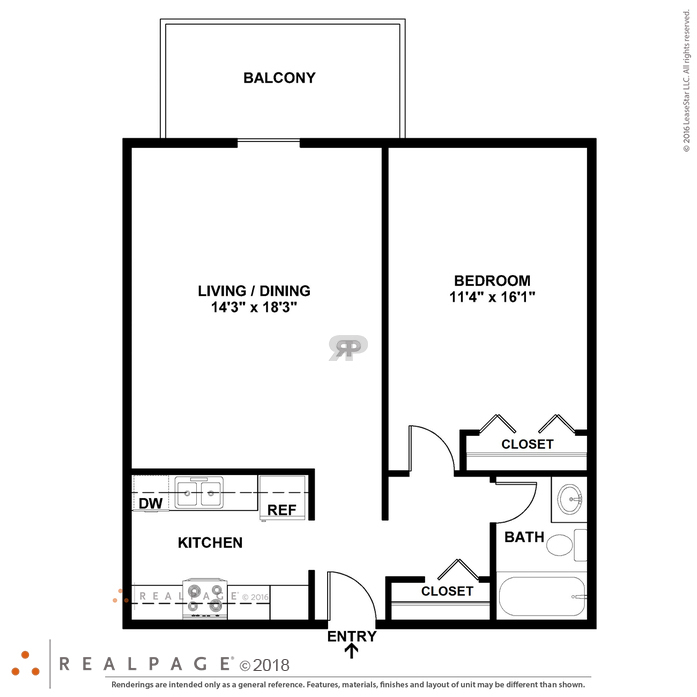 The one bedroom balcony floor plan has a private balcony off of the living room. 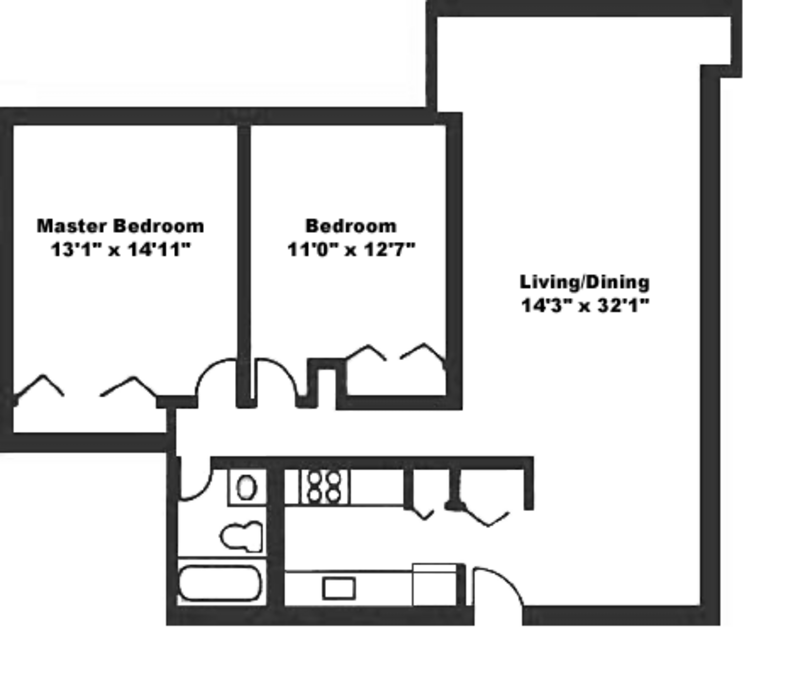 Living room area is 14'3" X 18'3"; Bedroom is 11'4" x16'1"; With Kitchen and Full Bathroom. 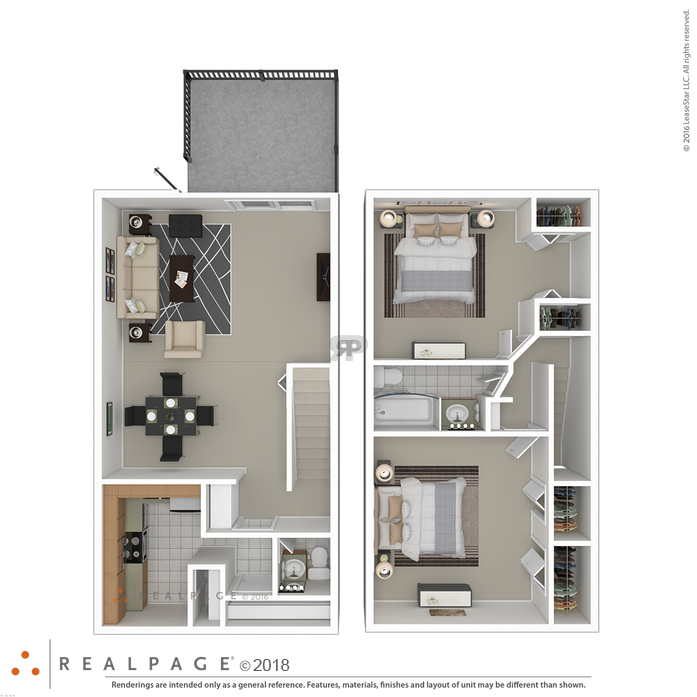 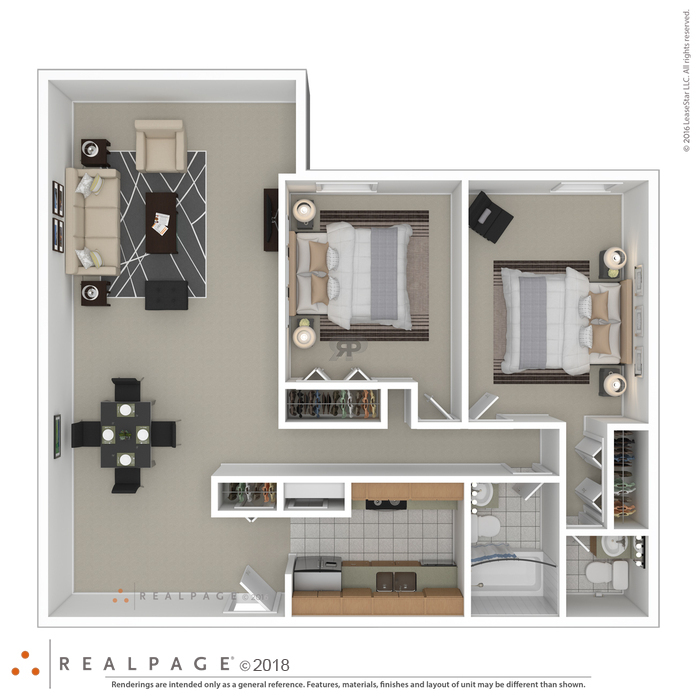 The one bedroom extended features the largest living room area at 12'3" x 24'3"; The bedroom size is 11'4" x 15'10"; With Kitchen and Full Bathroom. 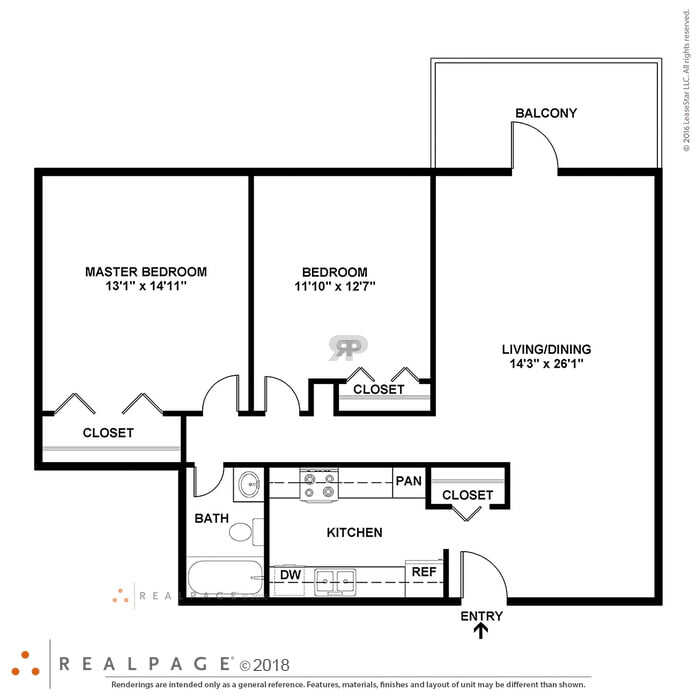 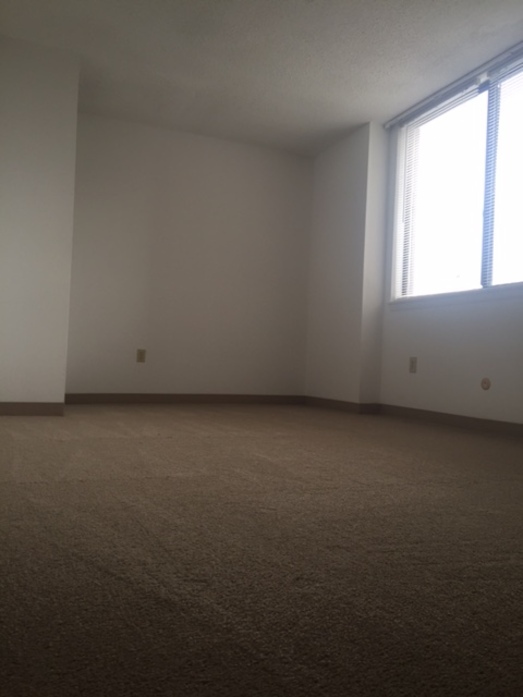 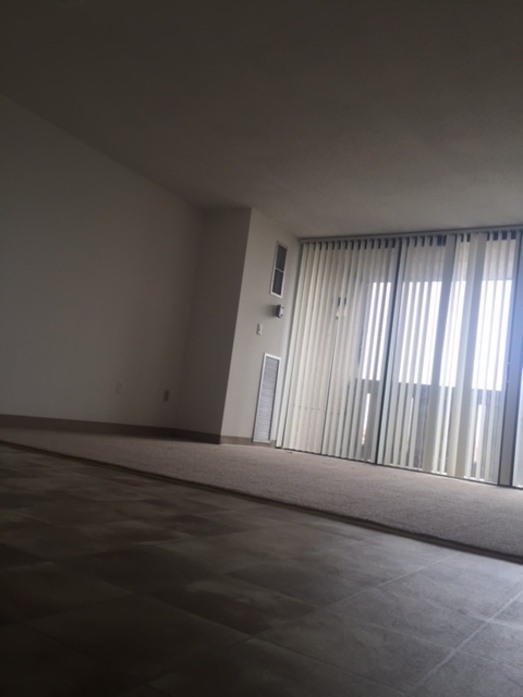 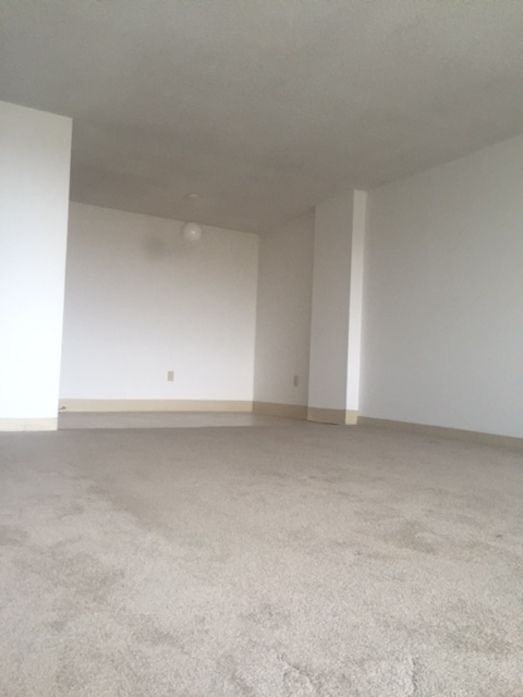 This two bedroom features a private balcony off of the living room area. 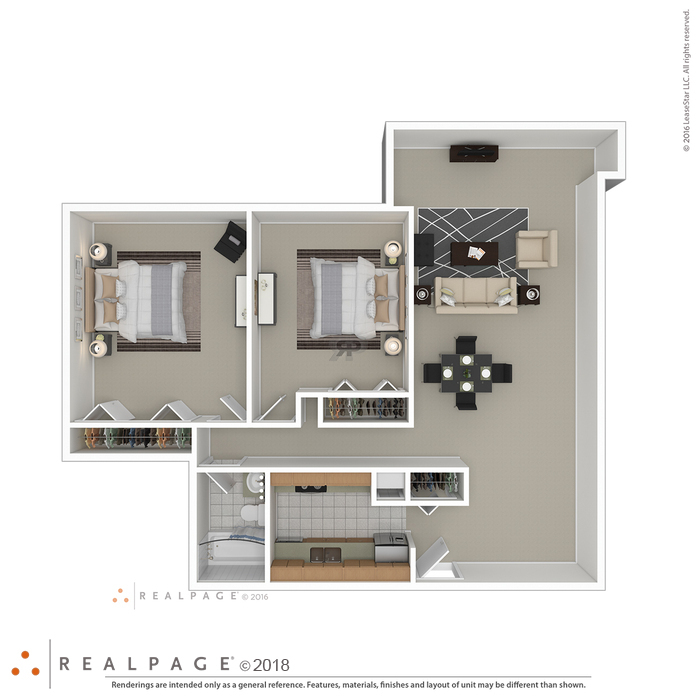 The master bedroom measures 13'1" x 14'11"; The second bedroom measures 11'0" x 12'7"; Your living room area is 14'3" x 26' 1"; With a Kitchen and Full Bathroom. 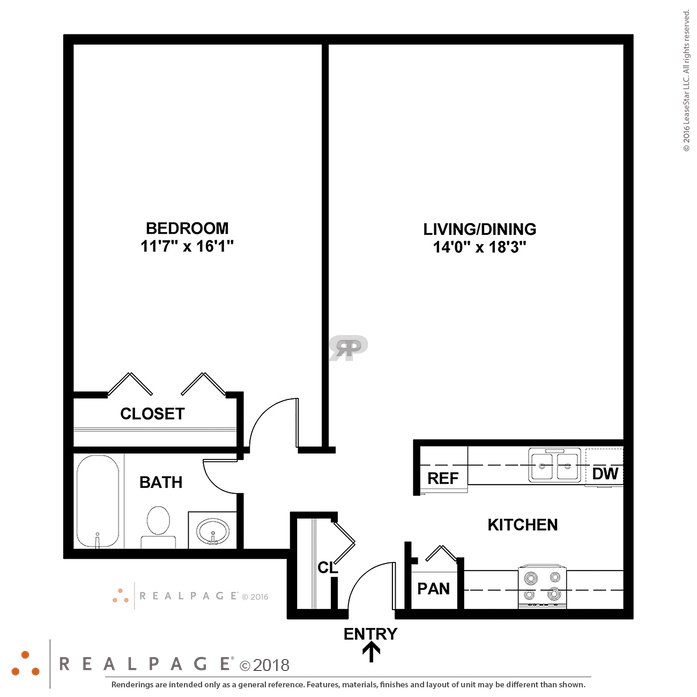 In the 2 bedroom basic you have a half bathroom in the master bedroom. 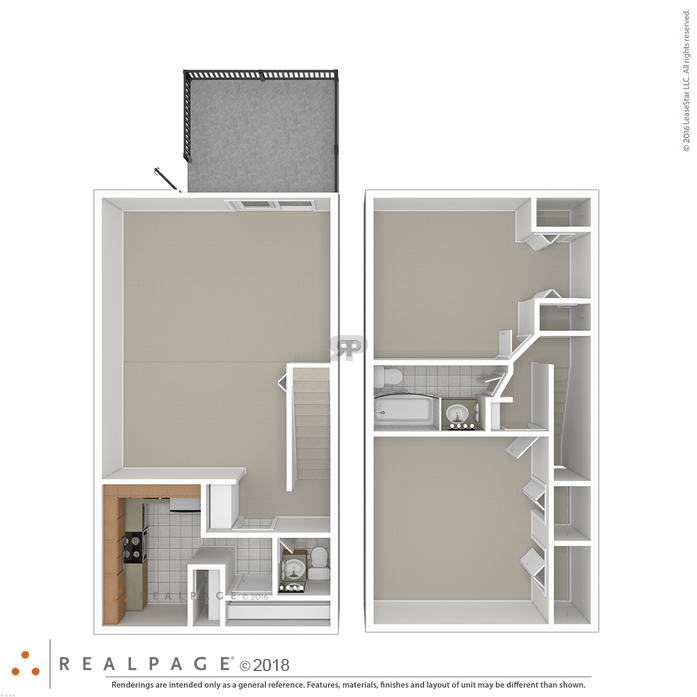 Great closets in both bedrooms. 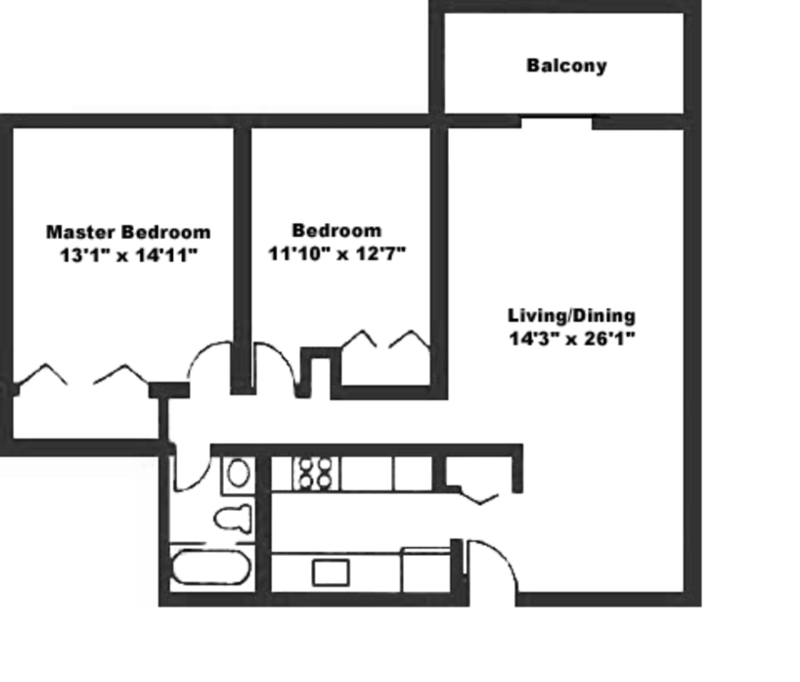 Master Bedroom measures 11'0" x 14' 11" and second bedroom is 11'0 x 12'9". 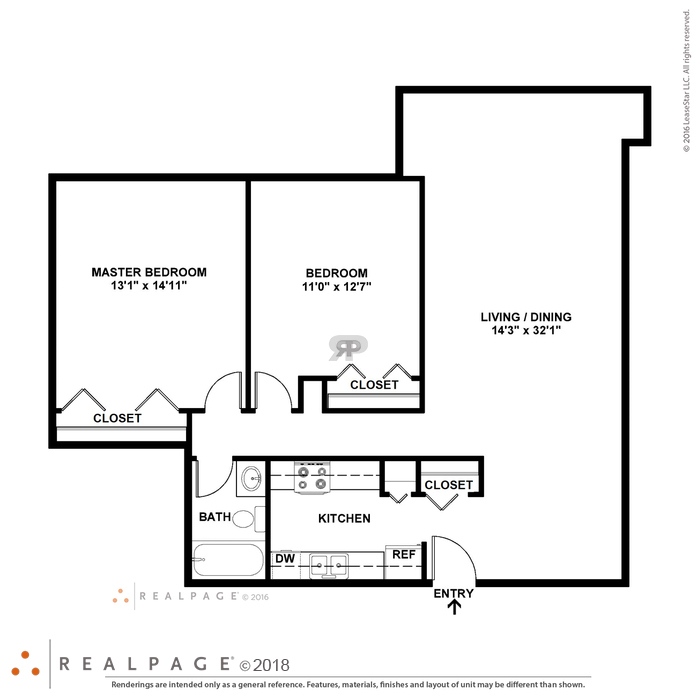 You also have a livingroom / dining area that measures 14'3" x 26'1" and a Kitchen. 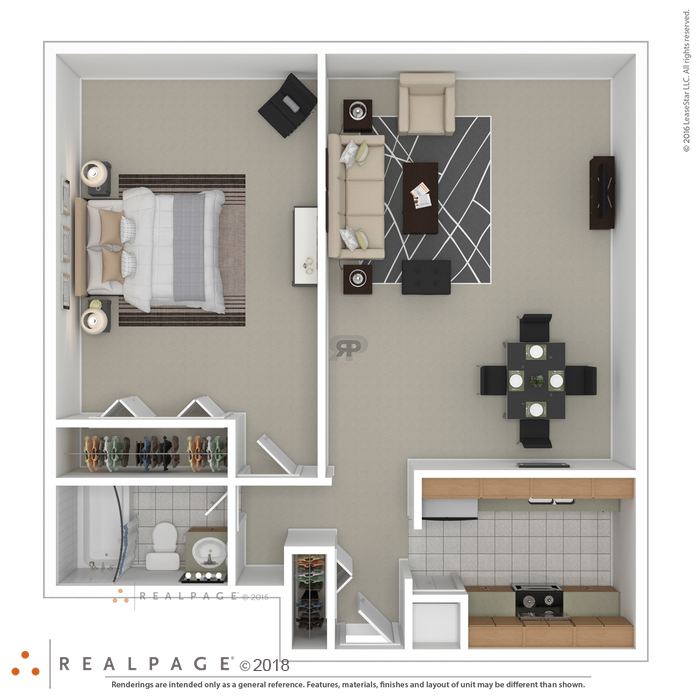 The two bedroom extended floor plan has one full bathroom and a half bathroom. 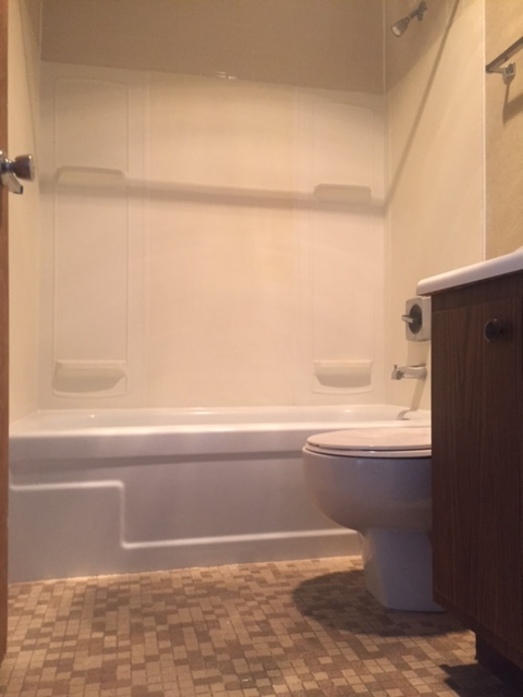 The half bathroom is located in the Master bedroom. 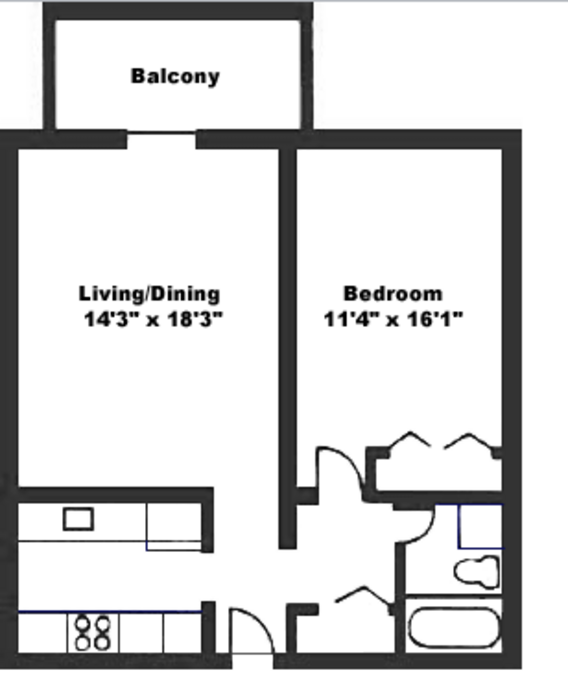 Master bedroom measures 11'0" x 14'11". 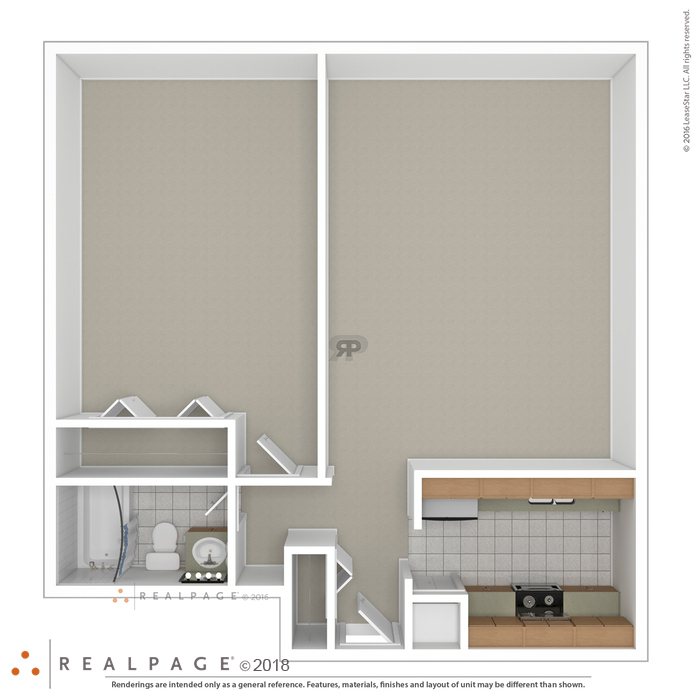 The second bedroom is 11'0" x 12'9" . 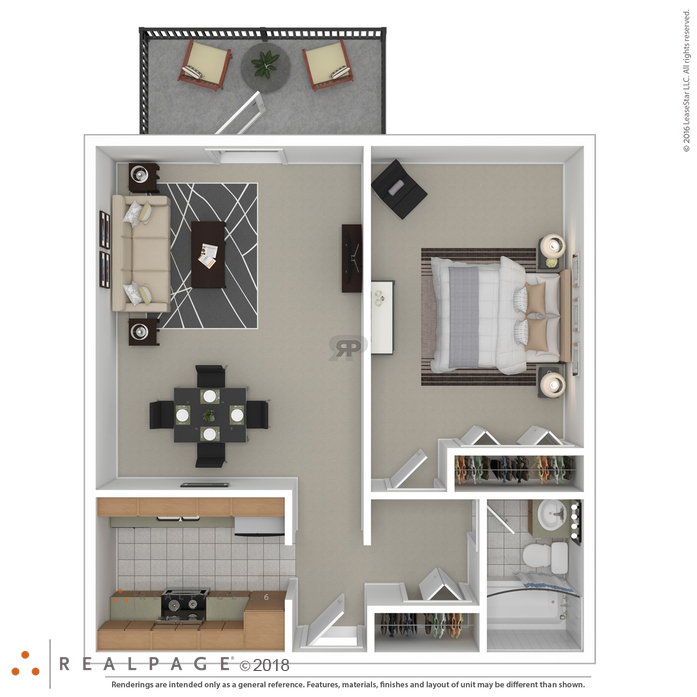 The living-room area is 14'3" x 32'1". 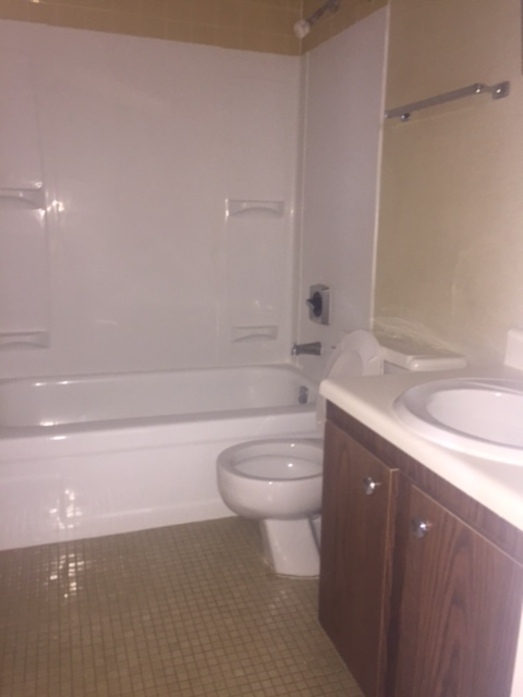 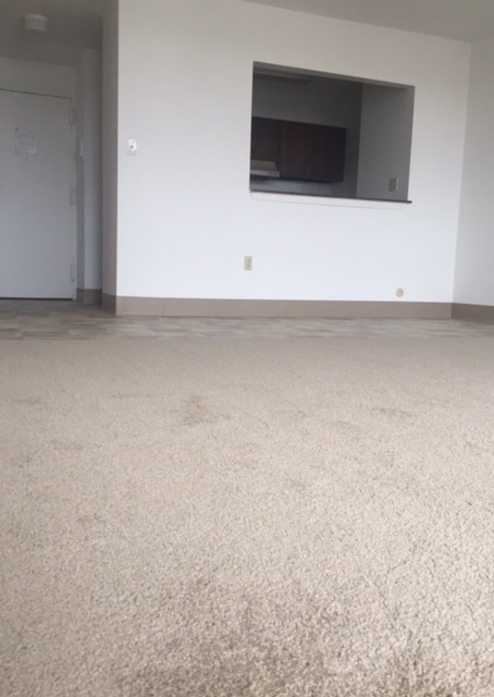 Very spacious. 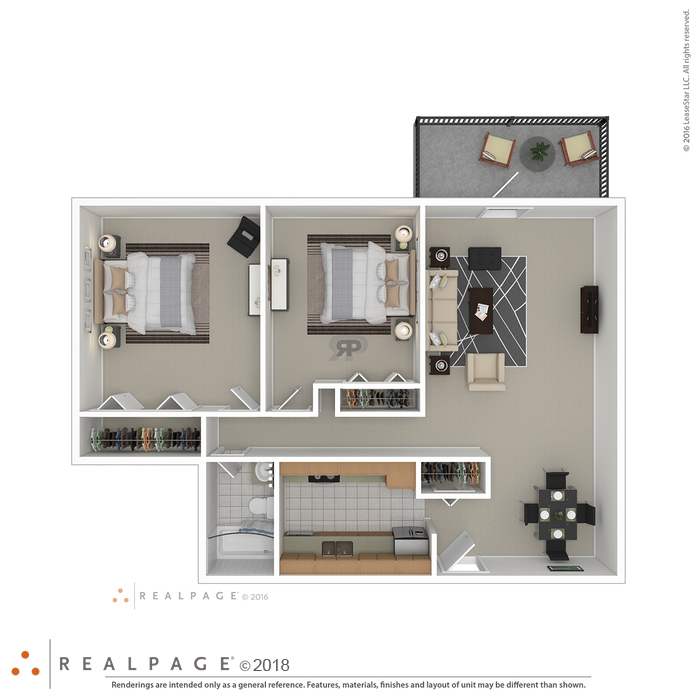 The townhouse floor plan features 2 levels of living with a half bath on the first floor and a private outdoor patio area. 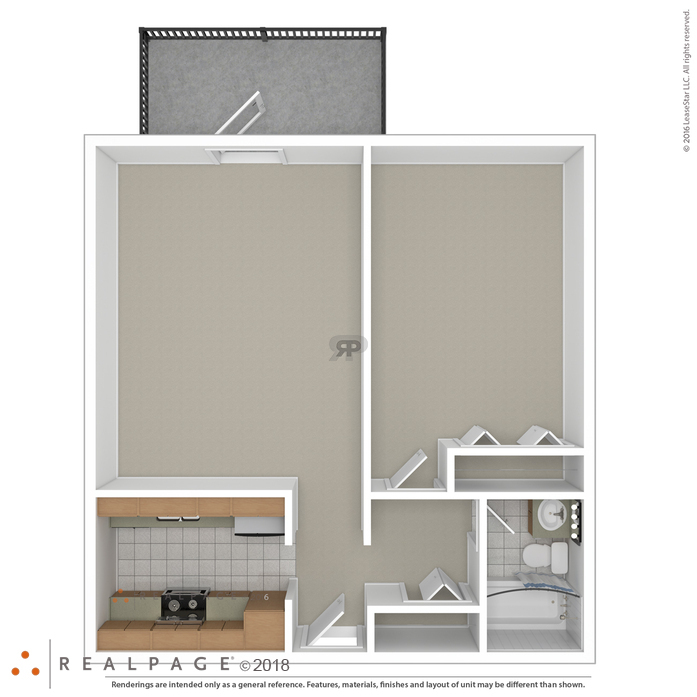 Your kitchen, livingroom / diningroom area has a spacious closet. 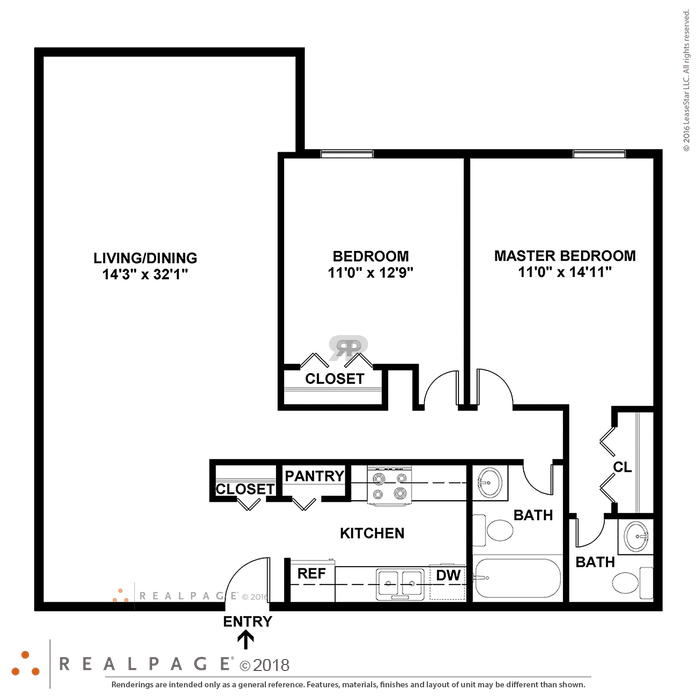 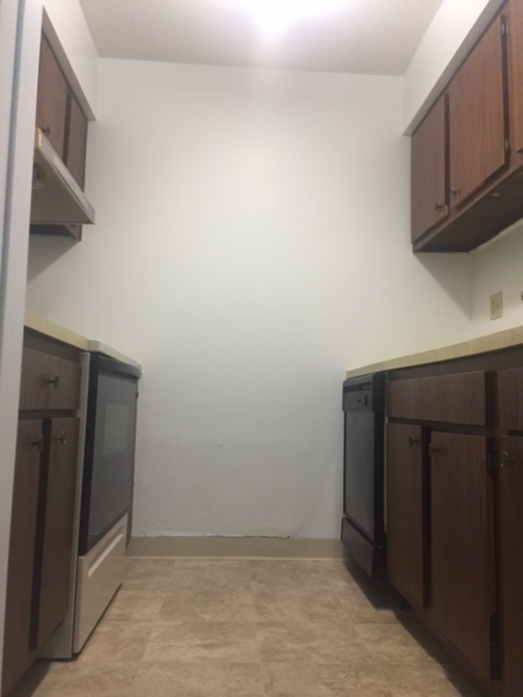 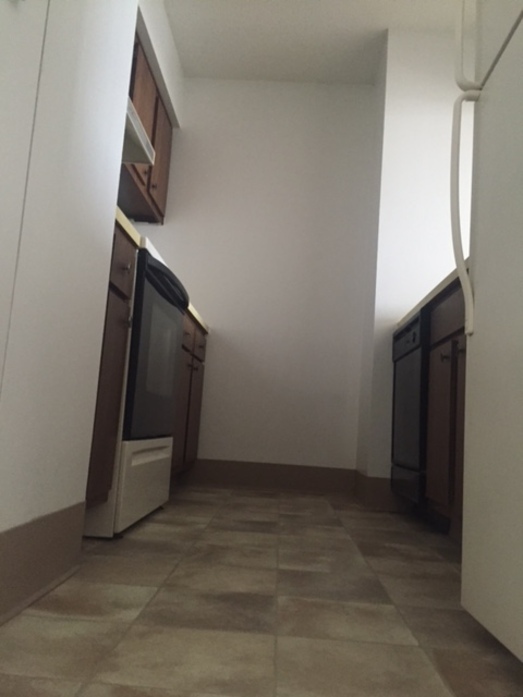 The second floor has your two bedrooms and one full bath. 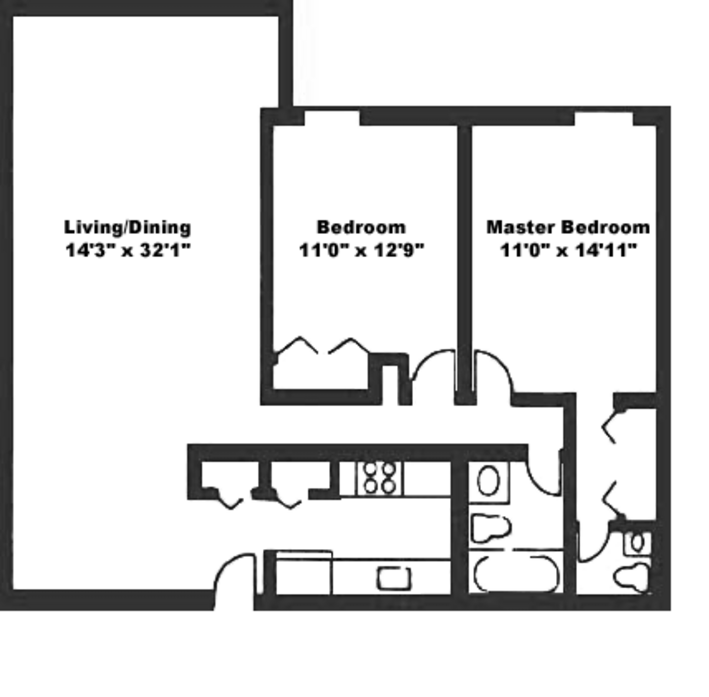 Master bedroom measures 14'6" x 13'7". 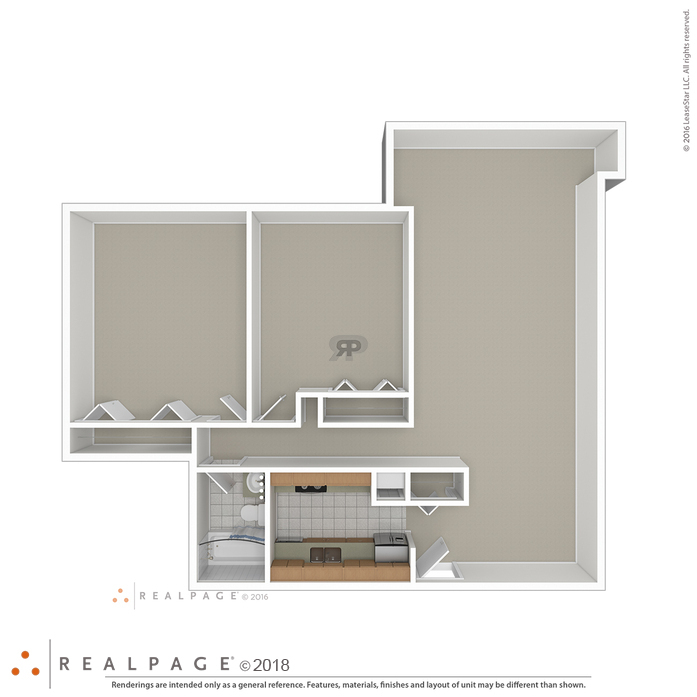 The second bedroom measures 14'5" x 12'6". 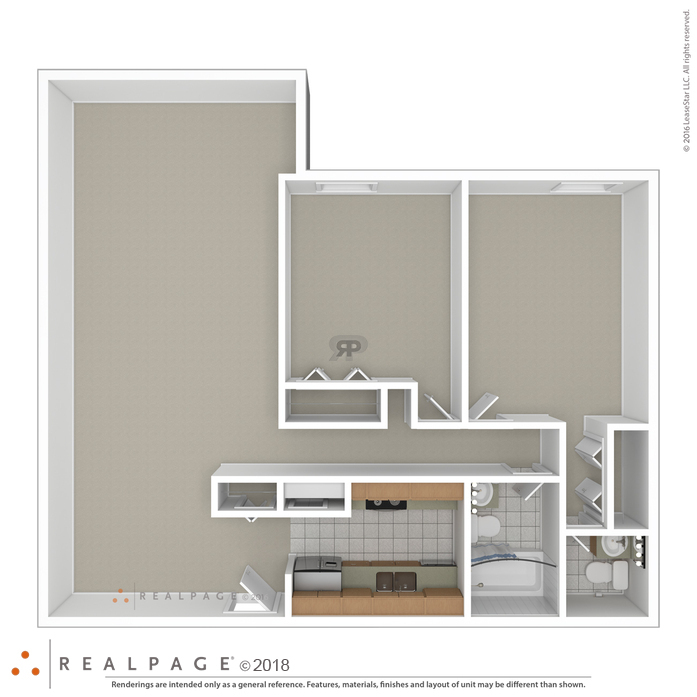 Your livingroom is 17'2" x 12'6"; Dining area 13'10" x 9'1"
The two bedroom extended apartment has an oversized living-room space that measures 14'3" x 32'1". 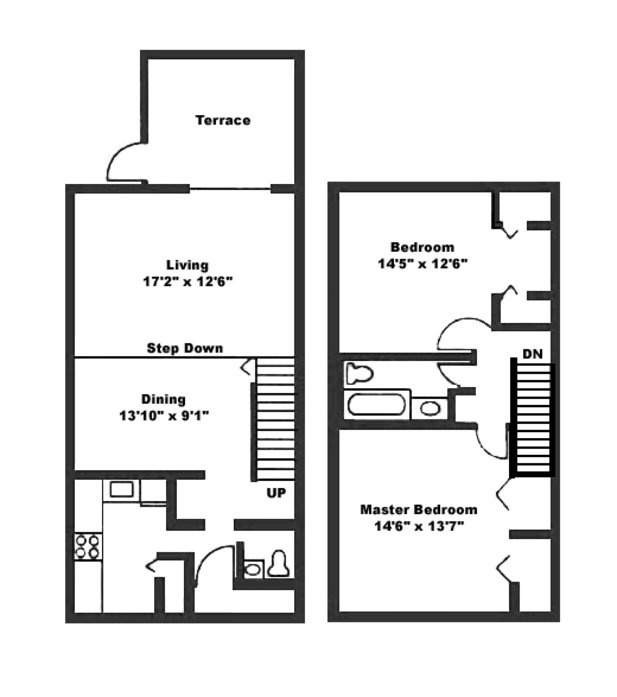 The master bedroom measures 13'1" x 14'11" and the second bedroom measures 11'0" x 12'7". 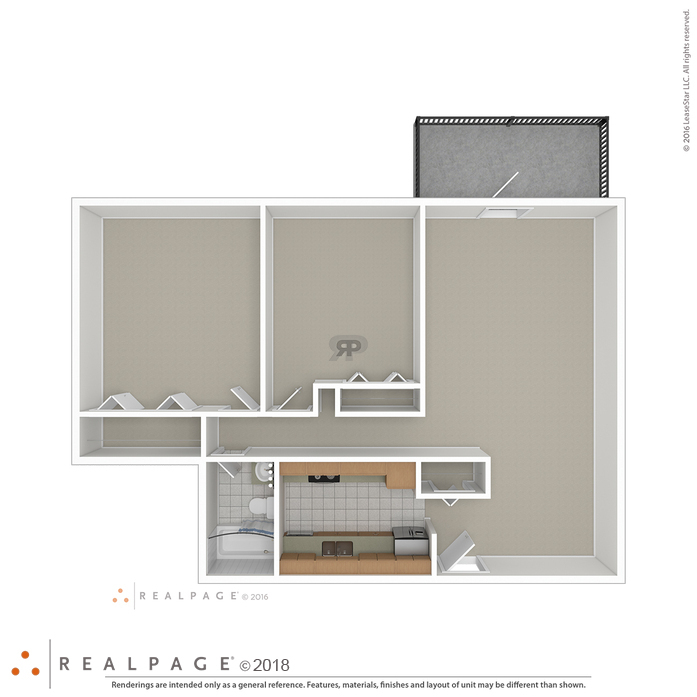 There is a Kitchen and Full Bathroom along with a linen closet.